Alberto Patishtan: Recognitions are given to the indigenous Tsotsil Professor Alberto Patishtán, unjustly imprisoned in Chiapas. Recognitions are given to the indigenous Tsotsil Professor Alberto Patishtán, unjustly imprisoned in Chiapas. Maybe the relevant judicial institutions did not recognize his innocence. But his people, and thousands of people around the world did. Maybe prison is one of the places where the most violations of human rights are committed. But today CERSS 5 was full of its defenders. And maybe hope is the one thing which is not lost, especially if your name is Alberto Patishtán. “I do not lose hope, I will keep fighting. For the love of life itself and the love of justice is above everything." So Patishtán spoke optimistically to the media today at a press conference held after the Mass for the day of the prisoner and the launch of the book “Accompanying hope". It was no coincidence that this book, published by the Network All Rights for All [la Red de Todos los Derechos Para Todos] was launched in the CERSS 5 with the presence of Patishtán. In fact, the Tsotsil teacher appears among the eight accounts it contains of great fighters for human rights. What is paradoxical is that less than two weeks ago Mexican justice ratified the conviction of this prisoner in struggle. "It is difficult to accept the decision made by the first collegiate tribunal in Tuxtla Gutierrez, the ratification of 60 years for an innocent man", Martín Ramírez López, a member of the Movement of the People of El Bosque, said with regret. There were many people who attended the event to see and hear the words of Professor Patishtán. But many also came to visit their own family members and to celebrate with them the day of the prisoner. In fact, today, CERSS 5 could have looked like anything other than a prison, if it were not for the endless bars and the long queues to enter. Even Raúl Vera, Bishop of Saltillo, and Felipe Arizmendi, Bishop of San Cristóbal de las Casas, joined the event. The celebration began at 10 am with a Mass attended by prisoners and their families. Then, in a corner of the prison yard and under the eyes of many prisoners who were enjoying the day with their families, the book "Accompanying Hope" was introduced. Agnieszka Raczynska, executive secretary of this organization, was in charge, and she was followed by participations from members of the Fray Bartolomé de las Casas Human Rights Centre or of Serapaz. The demands of the teachers and the account of the current situation of the teachers' struggle were also included in the meeting, thanks to an intervention from a teacher from section 7 who invited the audience to support this cause, which is so related to human rights. However, the most anticipated moment was the awarding of Recognition of Innocence to Alberto Patishtán. His compañeros from El Bosque took the opportunity to give him a framed recognition of innocence. "It is not only my people, there are also very many people throughout the world who recognize my innocence. Unfortunately the authorities have closed their ears and eyes," said the professor. "My conscience gives me freedom and keeps me strong and fearless". And if your name is Alberto Patishtán, hope will never be lost. 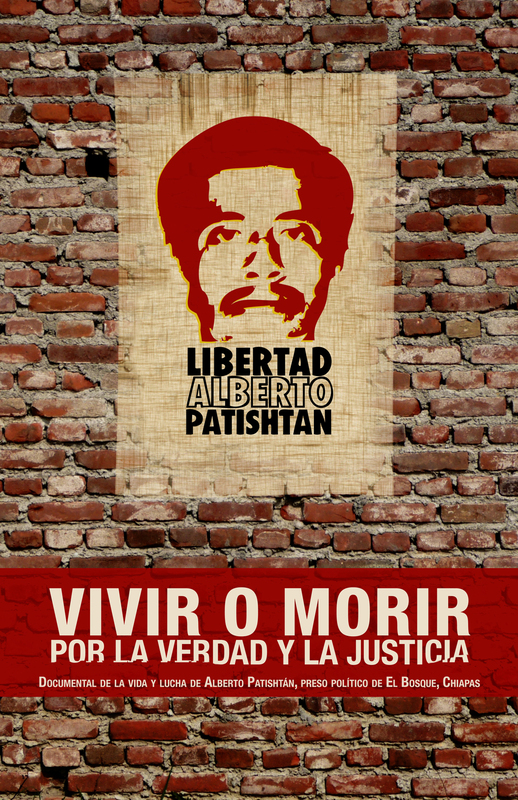 Martin Ramirez finished by saying: "We have a plan and that is to free Patishtán".